The scenery in this neighborhood is most romantic. On the east [Mt.] Sunapee lifts its high head... Sunapee lake, extending ten miles in one direction and three miles in another, can be plainly seen... One never tires, in summer, driving or walking over the delightful roads, through pine groves, or beside brooks lined with moss and shaded by the over-hanging trees... There is good fishing in the vicinity. The proximity of the lake is an inducement to many who love to fish from a boat, while the many brooks tempt those who love the speckled trout. -- Sketch of Newport, 1870. For well over a hundred years beautiful ten-mile long, three-mile wide Lake Sunapee has drawn summer vacationers. Vacationers in the late 19th century arrived at the lake by train, then boarded steamships to get to their destinations around the lake. A number of large resort hotels and private estates lined the lake's shores. In 1891 the steamer Edmond Burke struck an underwater ledge. This led to the construction of a lighthouse for $400 on Loon Island in 1893. The builders were the Woodsum Brothers, owners of the steamships that serviced the lake. 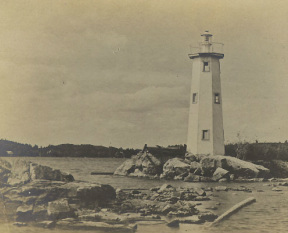 In 1896 repairs were being made to Loon Island Light when it caught fire. The damage was repaired, but in 1960 lightning caused the lighthouse to completely burn down. It was promptly rebuilt. The still-active, solar-powered lighthouse is maintained by the Lake Sunapee Protection Association. It can be viewed from the deck of the public tour boat Mt. Sunapee II.